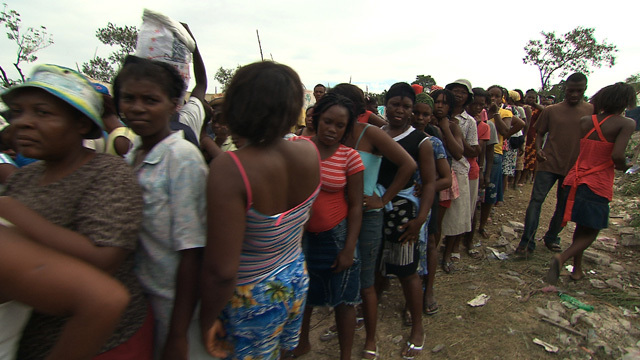 Haitians line up to receive aid. Before Haiti experienced a devastating earthquake on January 12, 2010, a team of Toronto filmmakers was already waiting in the wings to cover the disaster. PTV Productions had assembled an “Inside Disaster” team to document the Red Cross’s next major disaster relief mission under director Nadine Pequeneza. When the earthquake hit, the “Inside Disaster” website went live, and a documentary team was on the ground three days later. A year has passed since the earthquake, and the “Inside Disaster” project has grown into a collection of media documenting the aftermath of the Haiti earthquake and the humanitarian response to the massive crisis. The team created a three-part documentary series, which premieres on TVO tonight at 9 p.m. (The following two episodes will air on Wednesday, January 12 and Thursday, January 13, both also at 9 p.m.) The project also includes a family of interactive websites that aim to educate the public and grab the attention of web savvy students. The film series is a stark reminder of the destruction and death experienced by millions of Haitians. With images of bodies burning on the street and being lifted out of the rubble by bulldozers, the first episode sets the stage for the humanitarian response. 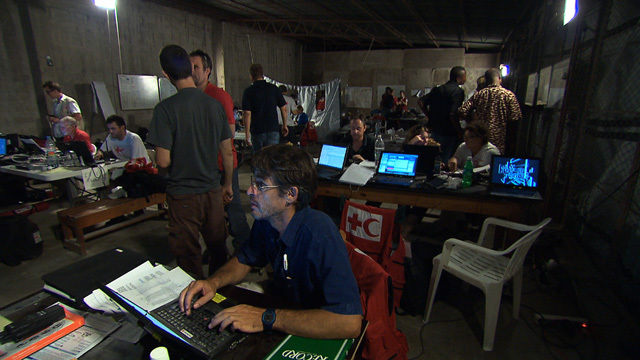 Because the film crew was embedded with the Red Cross, the film also documents the inside of the organization and the challenges of delivering urgent relief. In the weeks following the earthquake, the Red Cross struggled to coordinate providing aid to makeshift (and often frantic) relief camps, and found itself competing with other organizations for landing space at the Port-au-Prince airport. Not everything is bleak, however, and the series very deliberately reminds the viewer that Haiti is still a hopeful place. To develop the online component of the project, field director Nicolas Jolliet travelled with the film team on his own mission: to tell the story of those who were not receiving humanitarian aid. After arriving, Jolliet met two Haitian students—cousins Emmanuel Midi and Johnny Pierrot—who gave him access to communities hidden from most of the media. After spending his days gathering footage, Jolliet sat on the roof of the Canadian embassy with his satellite modem to send his coverage and blog entries to interactive producer Katie McKenna, back here in Canada. This led to what McKenna calls a “kind of insane twenty-four-hour cycle of work” driven by the urgency to make the coverage available to the public. To this end, the pair set up a Twitter account, a blog, a YouTube channel, a Facebook page, and a photostream, and made their content available under a Creative Commons license. The Red Cross’s logistics operation. The main “Inside Disaster” site provides an in-depth look at Haiti and humanitarian efforts, and links to a number of sister sites. This includes “Haiti Fixers,”, which advertises the services of cousins Midi and Pierrot: they act as facilitators for foreign journalists and humanitarian workers, and have had steady work as a result of the site with organizations. The web team has also created an interactive simulation game that plays like a post-earthquake “choose your own adventure,” from the perspective of a survivor, a journalist, or a humanitarian aid worker. It’s an educational tool aimed at students high school-age and older, and includes vivid documentary footage. It was nominated for a Canadian New Media Award for best web-based game, and the entire network of sites was nominated for best cross-platform project. This integrated web-video model works. It breathes, it speaks, and it grabs your attention. PTV is now promoting the project to teachers and students as a way to teach about humanitarian efforts and the Haiti earthquake. By taking a more nuanced approach to the Haiti earthquake, the project is a great way to start the conversation about what we can learn both from the event itself and from our response to it. Inside Disaster will play again at the University of Toronto, in the East Common Room of Hart House, on Wednesday, January 26 at 6:30 p.m. It will also re-air in separate episodes on TVO on Wednesday, January 26; Wednesday, February 2; and Wednesday, February 9. A fundraiser for Haitian schools, “Toronto for Haiti,” featuring talks and performances organized by the Groupe Professionnel Haïtien de Toronto. January 12, Revival (783 College Street), 8 p.m.
An evening of entertainment, food, and information called “Hope in Haiti,” supported by The Toronto Haiti Action Committee and the University of Toronto. This event is a fundraiser for SOPUDEP, a Haitian organization that manages a school and provided relief services after the earthquake. (During the recovery period, SOPUDEP moved into temporary classrooms created by Ryerson interior design students.) January 14, The William Doo Auditorium (35 Willcocks Street), 6 p.m.
A panel discussion, “Haiti: One Year Later,” featuring Doctors Without Borders co-founder Marilyn McHarg and Toronto Star columnist Catherine Porter. February 2, North York Central Library (5120 Yonge Street), 6:45 p.m. Photos courtesy of PTV Productions.